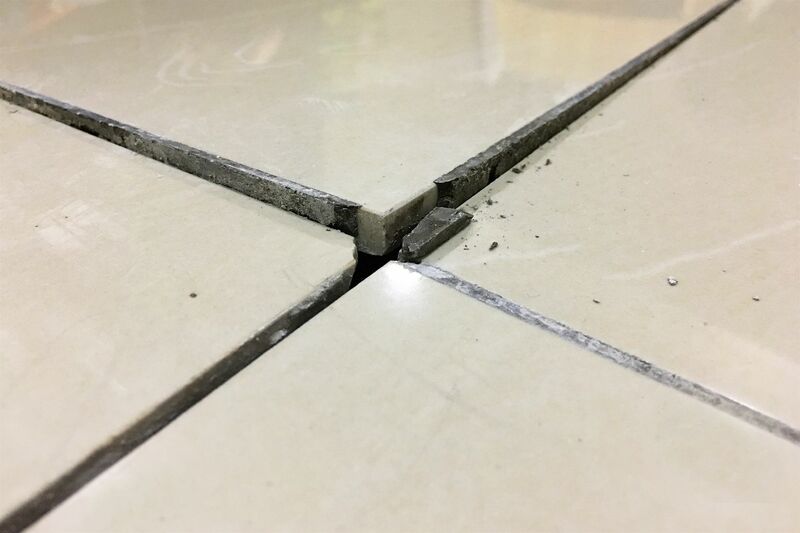 At Strassburger Tile Perfection, we use state-of-the art tools to ensure that when we replace your loose or broken floor tile, we do it right. First, we use a carbide bit oscillating tool to cut the grout surrounding the broken floor tile. This tool is specially designed to allow us to accurately remove the broken tile without cracking any other part of your floor. We then remove the loose floor tile and grind down the existing mortar to prepare a smooth base to set the new tile. With many do-it-yourself jobs, this step is often skipped, resulting in an uneven replacement, or causing the floor tile to come loose again later. By following this process, and having a sound structural subfloor, we have never had a tile come loose after being replaced. If the substrate surface is stable, we guarantee our tile replacement for the life of the floor. Normally, when a loose floor tile is fixed, it is clear as to which tile was fixed or replaced because of the colour difference in the new grout. With our grout cleaning and grout colour sealing service, we can ensure that the grout surrounding the new tile is perfectly matched to the rest of your floor. The Strassburger team is so confident of this that if someone can find which floor tile was replaced, we’ll give you your money back. Back up your tile replacement with the Strassburger Tile Perfection guarantee.